The Caribbean island of Puerto Rico has turned to a small two-year old company in Montana with only two fulltime employees to restore its crippled electrical grid that is owned by the U.S. territory. 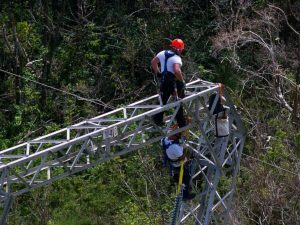 Whitefish Energy announced last week it had signed a contract for $300 million with the Electric Power Authority of Puerto Rico to repair as well as reconstruct large parts of the electric infrastructure of the island. The contract is the single biggest to date issued in the relief effort following the massive destruction caused by Hurricane Maria over a month ago. On Monday, Whitefish said it now has 280 workers on the island, using linemen from across the U.S., most have been signed as subcontractors, and the numbers grows by an average of 10 to 20 per day. It said that it was near the completion of its infrastructure work that would energize a portion of key industrial facilities that are highly critical to restarting the island’s local economy. The power authority, which is known as PREPA, decided to hire the small Montana firm instead of activating mutual aid arrangements it had with other utilities. For several years, the agreements have helped utilities in the U.S. including those in Texas and Florida recently, to recover quicker following devastating natural disasters. The decision, which is considered very unusual, to hire a tiny company that is for profit, has drawn much scrutiny from Congress and arrives amidst concerns over the spending of bankrupt Puerto Rico, as it attempts to provide relief to its more than 3.4 million residents, of which the overwhelming majority still do not have power more than one month after the hurricane made landfall. The executive director of PREPA, Ricardo Ramos and the Authority’s spokesperson were not responding to emails that asked why the mutual-aid network had not been activated. On a tour of the Palo Seco idled power plant, Ramos did say that Whitefish was the first utility company that could arrive and were the first to accept PREPA’s terms and conditions. Ramos added that the territory was completely content with Whitefish’s work and the doubts raised about the contract with Whitefish, in his opinion, are unfounded. He said that concerns over Whitefish were likely spread by competitors who were jealous. Officials at Whitefish said the expertise of the company in areas that are mountainous make it very well suited to do the work in Puerto Rico and that it jumped at the opportunity when other companies hesitated due to concerns over being paid.